This Iranian horror movie has been getting rave reviews across the board, and whilst I don’t share quite the same enthusiasm, this is an effectively crafted movie that successfully blends supernatural horror with some biting social commentary in its setting during the 1980’s Iraq-Iran war. 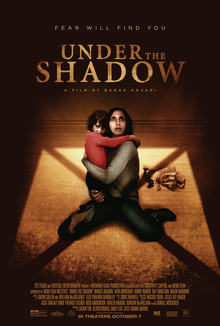 The main focus of ‘Under The Shadow’ is on Shideh, a woman who decides to stay in Tehran with her daughter despite heavy bombing raids that have driven most of the neighbours to the countryside, and her doctor husband to the military under conscription. When her daughter loses her favoured doll and starts talking about seeing a lady in the house, the blend between reality and the supernatural starts to impact on Shideh’s psyche. I often think the label of a horror can be slightly misleading for some films, and whilst ‘Under The Shadow’ does have scary moments, this is a lot more psychological in its stylings and has much more to say for itself than to purely frighten the audience. Shideh is portrayed brilliantly by Narges Rashidi, who superbly depicts a woman starting to question her ability as a mother. The supposed supernatural beings that have invaded the house are known as djinn, as explained by a neighbour, and their presence only serve to heighten Shideh’s paranoia and fears. The film does lean back on some established horror tropes, such as the creepy doll (but let’s be honest, who isn’t freaked out by a creepy doll?! ), but for the most part it’s refreshing to see the focus on the characters and less on the supernatural elements. The time period and location the film is set in also allows the film to tentatively explore some interesting avenues, such as the nature of a muslim woman’s responsibilities and place in this world, with her regrets at not being allowed to qualify as a doctor whilst her husband could and an incident with her headscarf drawing attention to the point without oversimplifying the themes. ‘Under the Shadow’ is very slickly written and directed and there’s rarely a wasted sequence or extra padding – the characters feel real and lived in and the threat from the djinn, whilst supernatural, feels like something one could start to believe in amidst the wartime environment of fear and paranoia. As far as thought provoking psychological horror goes, this is one of the best entries of the year in a refreshingly new setting for the genre.